And Then There Were Two !! I am very good at starting projects but, sadly, not so good at finishing. That’s why I have umpteen books in progress, a good size basket full of knitting projects and a draft folder with multiple posts sitting waiting to be finished and posted. The work in progress I felt guiltiest about was one single solitary mitten. I had no good reason for leaving it partnerless. The pattern, Bella’s Mittens, is lovely. Simple but very effective, very clearly written and laid out, and free to boot. 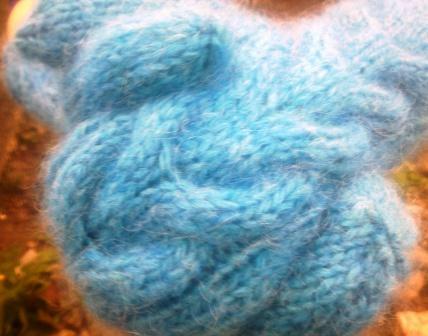 The yarn, a couple of balls of Adriafil Melodia that I had left over from a bigger project, was lovely; the perfect balance of softness, substance and fuzziness. I am so sorry that it has been discontinued. The first mitten fitted beautifully, and yet it took me more than a year to get around to knitting it’s partner. Last weekend though I was inspired, and I pulled out the wool and needles and knitted my second mitten. It matches perfectly and I really feel silly now for leaving it for so long. My only small disappointment is that the cuffs turn up a little. 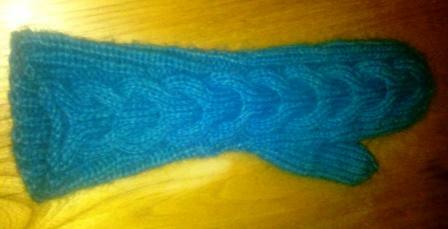 It’s nothing I can live with but I think if I knitted the pattern again I’d add in a little hem. 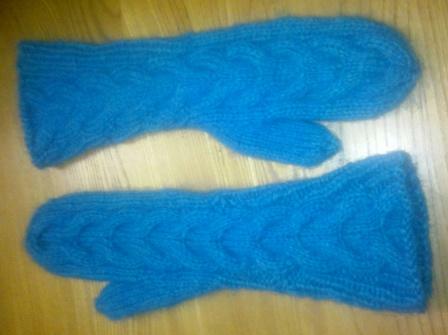 I’m sure I will make another pair of these mittens one day. The pattern really is lovely, and it would be very easy to add or subtract a pattern repeat to change the length. For now though I’m wondering which work in progress to pick up next, and thinking that if the stormy weather that we’ve had for the last few days gets any worse I might even have a chance to wear my new mittens sooner than I thought. I think you and I are soul sisters. I love to start new things – knitting, quilting, books, cleaning and writing projects. I just hate to finish. For my knitting, it’s socks. I have lots of just one sock. I got a new book that shows how to do two at a time so maybe that will be my solution – in the future. First I have lots of seconds to finish. Your mittens are quite lovely. They’re beautiful and I love the colour! Frost here this morning. Mittens would have been very welcome, turning up cuff or no turning up cuff. They’re gorgeous and I love the colour! I also admire your having these completed way ahead of any bad weather. For some reason I can’t seem to master the art of knitting off-season so that I’m garment-ready when they’re needed. I know what you mean about starting things – I have a few things on the go at the moment. Though have had a spurt of finishes lately.